A photograph showing a school opt-out form for the Pledge of Allegiance was frequently misinterpreted to represent the opposite. 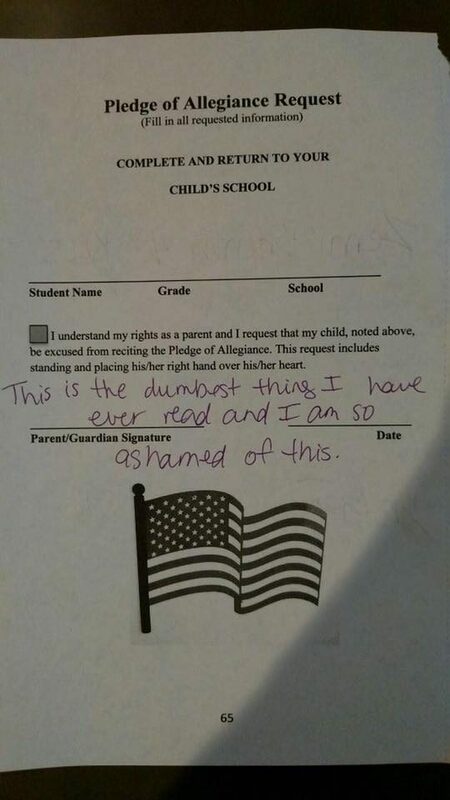 Because the document is titled “Pledge of Allegiance Request,” many viewers misinterpreted it as a form that needed to be filled out and signed by a parent for a student to be allowed to recite the Pledge of Allegiance in school, but it actually represents the opposite. This [form] is a response to a Florida law voted on by the Florida Legislature and signed by Governor Rick Scott. We are required to comply with the law. Florida Statute 1003.44 dictates to all school districts in Florida that, “each student shall be informed by a written notice published in the student handbook or a similar publication pursuant to s. 1006.07(2) that the student has the right not to participate in reciting the pledge. Each student shall be informed by posting a notice in a conspicuous place that the student has the right not to participate in reciting the pledge. Upon written request by his or her parent, the student must be excused from reciting the pledge. Many social media commentators took the opportunity to blame President Obama for the supposed lack of patriotism encapsulated in this opt-out form. However, students in Florida have had the right to opt out reciting the Pledge since at least 2000, long before the Barack Obama was elected to the White House. That connection between an older Florida law and President Obama might have come about because the posting of this opt-out form to social media followed closely on the heels of a fake news story reporting that the President had signed an executive order banning the Pledge from all American schools.